Hour-long crime drama. Entire fifth season watched for review. The fifth season of Justified mistakes being complicated for being complex. It’s a pitfall the always busy series often flirts with indulging, but it’s been able to avoid it in the past, particularly in its third season, the show’s previous height for pointless busyness. In season five, the many plot threads work on occasion, and every episode has its pleasures, but the show often feels at a loss as to what to do with its two most important characters, U.S. Marshal Raylan Givens (Timothy Olyphant) and backwoods criminal mastermind Boyd Crowder (Walton Goggins). It’s still an entertaining show, but Justified is also capable of brooding greatness—and attained it as recently as a season ago. It’s disappointing that the series gets choked by having so much stuff going on. The problems are evident from the first handful of episodes, which introduce a bevy of new colorful criminals for Boyd to manipulate and Raylan to track down. These episodes then suggest the season’s main villain wouldn’t be one or two of these bad guys but all of them. Justified’s best seasons—its second and its fourth—succeeded by keeping things relatively simple. The second season focuses on one main villain in Margo Martindale’s Mags Bennett, while the fourth focuses on the search for a man named Drew Thompson, who seemingly disappeared into thin air 30 years prior, then is found in an unexpected place. But season five doesn’t just service Raylan and Boyd. It also has to check in on Canadian hit men, gangsters from all corners of the country, the continuing adventures of Wynn Duffy (Jere Burns in one of the best cockeyed villain performances on TV), an entire family of two-bit criminals, and the adventures of Boyd’s fiancée, Ava (Joelle Carter), in prison. It was a lot of material. Ultimately, it’s too much. To the show’s credit, its creative staff appeared to recognize this around the season’s midpoint and started mercilessly trimming some of the fat. Unfortunately, it mostly did this via shocking acts of violence that became so workmanlike and predictable that they were robbed of any shock or power whatsoever. (The season’s fifth episode, while solid, is particularly guilty of this, killing off any number of minor villains but failing to get emotional reactions—even relief—for most of their deaths.) More problematic: Nothing vital is done with the Crowes, the criminal family who end up being the season’s main antagonists mostly due to economy of cast. There’s good material with the Crowes, particularly when Michael Rapaport (as potentially dangerous big brother Daryl Crowe Jr.), Alicia Witt (as somewhat sensible sister Wendy), or Damon Herriman (as dumbass cousin Dewey) are on-screen. The overall, however, sense is that they were a weak attempt to do a quick copy-paste version of the Bennetts that’s just different enough to pass muster. The Ava material is even more problematic, miring the character in a women’s prison where her status is constantly in flux and placing strain on her relationship with Boyd in a way that rarely worked, since so much of the singular chemistry between the two characters comes from when they share the same screen. The Ava storyline becomes an endless loop of the character facing off with a new prison foe, only to find some unlikely way to win and repeat the cycle all over again. (A particular low point involves an encounter with a guard played by Danny Strong, which underlines many of the season’s problems with trying to jolt the story to life via shocking violence.) Even here, there are characters and moments that work—it’s hard to waste character actress Dale Dickey, after all—but the overall feel was of a story that was mostly there to put Ava in a holding pattern, rather than reveal anything important about her. The malaise even grows to infect Raylan and Boyd, though the latter is far more susceptible. In fact, there are long stretches of the season where Raylan essentially becomes a supporting player in his own show, with Boyd, Ava, and the Crowes commanding far more screen time. Pushing the protagonist down in the roster a bit to play up some of the supporting players isn’t always the worst move for a show at this point in its life cycle, but season five never came up with a story for Boyd that felt like a match for the raw power of even the smaller moments in, say, the story of Raylan’s boss, Art (Nick Searcy), learning one of his charge’s darker secrets. When season four ended, Boyd’s story seemed like it would be about the would-be kingpin being forced to play lackey to somebody else (in this case, Wynn). In season five, Boyd is so quickly back to scheming and plotting that it’s almost as if the major setbacks he’d encountered last year hadn’t happened. Again, that might have worked if the story were any fun, but he’s soon stranded in a go-nowhere plot line that involves going to Mexico and getting enmeshed in the heroin trade. Yet Justified is still capable of moments of startling insight and even poetry, of moments that reframe its characters in such perfect fashion that the viewer reconsiders everything that’s known about them. In one episode, Raylan’s new squeeze, Allison (a largely unnecessary character played by Amy Smart), suggests to him that she knows he would run into a burning building to save someone’s life—but she also suspects he’s the one who lit the fire. 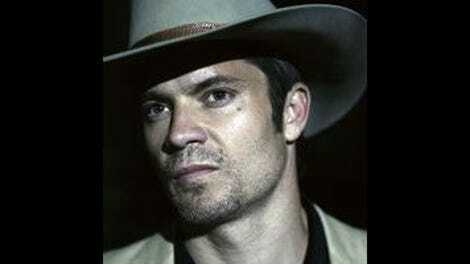 It’s a perfect encapsulation of everything that makes Raylan a compelling hero, governed by his better natures but also not averse to giving in to temptation, and it nicely mirrors the season’s best, most complicated material, unfolding in the deteriorating relationship between Raylan and Art. Every episode of the fifth season has moments like that, and a few of them—particularly the 12th, which is one of the best episodes the show has ever done—provide reminders of just how good this show can be. Tonight’s finale reveals just how much the season has been hamstrung by being in a holding pattern while waiting for next year to bring the series’ final season. The setup for the future is filled with potential, and it finally feels like the show can kick off some of the constraints that artificially held it back this season. 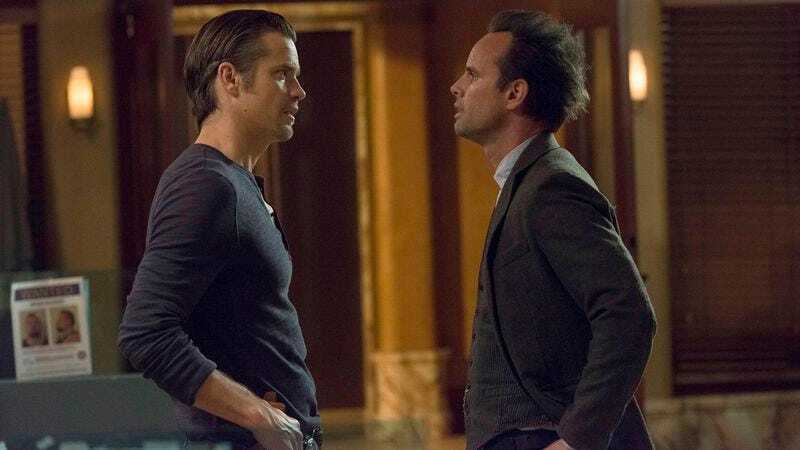 Yet even if the sixth and final season of Justified is one of its finest, it would only relegate the series to that old rule that used to govern Star Trek movies: The even-numbered ones are the best.